The soon-to-be-completed 398-unit Lumen apartments. Editor’s note: Over the next several weeks, Tysons Reporter is profiling the eight districts of Tysons. This is the seventh article in that series. If Tysons Central 123 is Tysons’ Fifth Avenue, Tysons Central 7 is its Wall Street. Anchored on the original “Tyson’s Corner” and the Greensboro Metrorail station, Tysons Central 7 is one of Tysons’ four downtown districts. It is the most similar to a conventional “Central Business District” elsewhere in the United States. 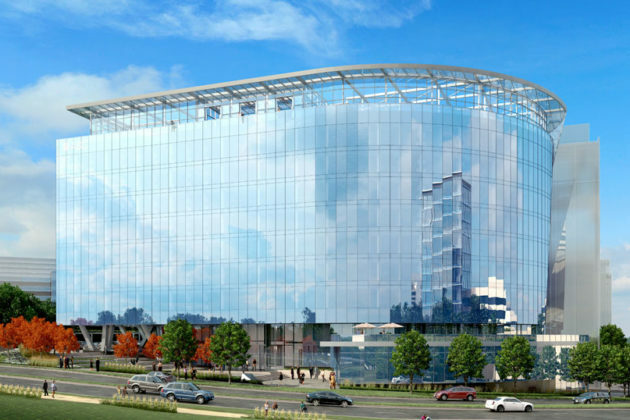 Northeast of Leesburg Pike, the district “will continue to have one of the highest concentrations of office space in Tysons.” Southwest of Leesburg Pike, planners intend a “Civic Commons” to be the heart of the Tysons community — but change might be slower here than in other downtown districts. Tysons Central 7, named for the highway number of Leesburg Pike, is home to towers like 8100 and 8200 Greensboro Drive — modernist offices surrounded by lots of surface parking. 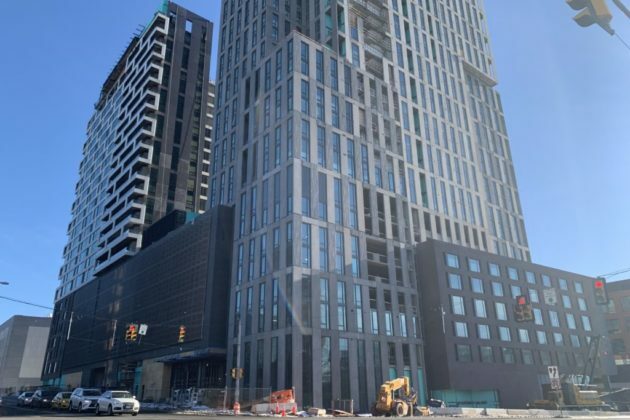 It is also home to The Boro, a development opening later this year that consists of mixed-use high-rises surrounded by urban plazas and a new street grid. If the former represents Tysons’ past, and the latter represents Tysons’ present, both will leave their marks on Tysons’ future. Predictions are that Tysons will grow to 200,000 jobs and 100,000 residents by 2050. 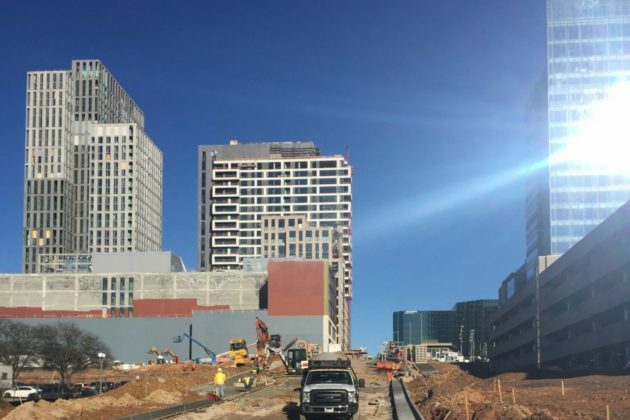 Whether you think those predictions are conservative or generous, it is inevitable that the imbalance between jobs and residents will continue to be a major factor shaping Tysons’ development. Many of the new residences will be located in the districts like Old Courthouse that lie a little farther from the Metro, leaving the office pressure on the downtown. 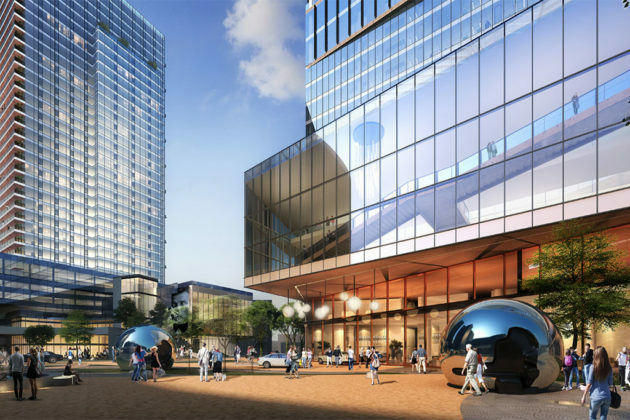 Even as it diversifies with some retail, residences, and hotels to “become a vibrant 24-hour area,” Tysons Central 7 will continue to be defined by offices of all kinds, old and new. 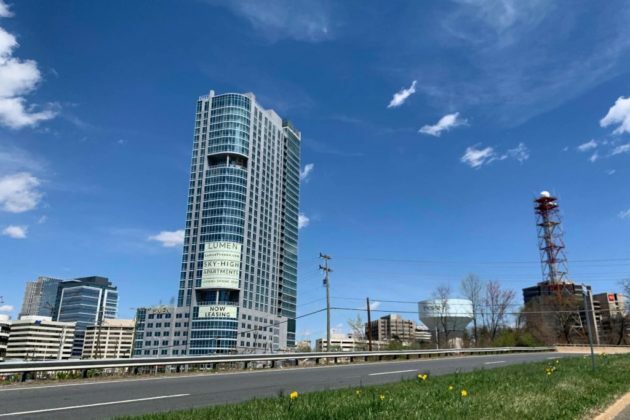 Tysons Central 7 lies on what is naturally the most elevated land in Fairfax County, making it perfect for ambitious builders hoping to leave their mark on Tysons’ emerging skyline. Editor’s note: Over the next several weeks, Tysons Reporter is profiling the eight districts of Tysons. This is the sixth article in that series. North Central, sandwiched between downtown Tysons and the Dulles Access Road, is in some ways the quintessential Tysons district, with neither the flash of a Metrorail station nor the moderating influence of surrounding suburbs. 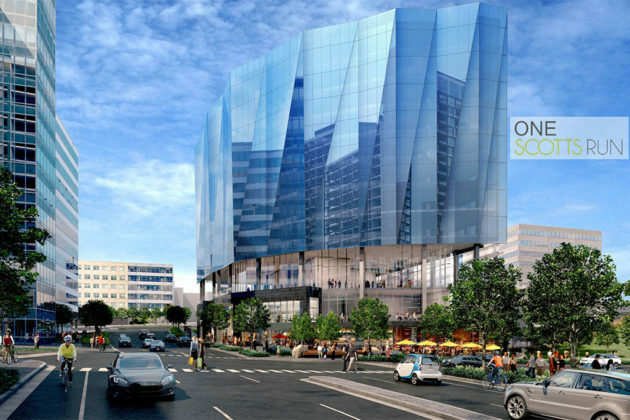 It will remain a lower-density office option compared to the higher-density downtown districts, and will add some more urban residential neighborhoods along with a new park and a “circulator” transit option connecting it to the Metro. North Central represents Tysons’ conventional approach to development in ways that other districts, with their Metrorail stations or surrounding suburban areas, don’t quite. Because it backs onto the Dulles Access Road, it is the only non-downtown district that is not required to provide a smooth transition to a suburban area. However, because it lacks a Metro station, it is not yet undergoing the kind of radically-transformative transit oriented development witnessed along the Silver Line. In some ways, the absence of those two factors make this perhaps the district where Tysons is most itself. 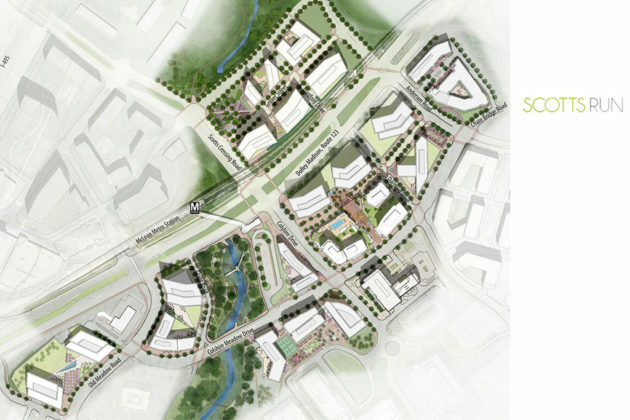 Plans for the area show a strip of office-only zoning along the fringe adjacent to the Dulles Access Road and the Beltway, with mid-density urban residential neighborhoods in the center and southwest of the district. 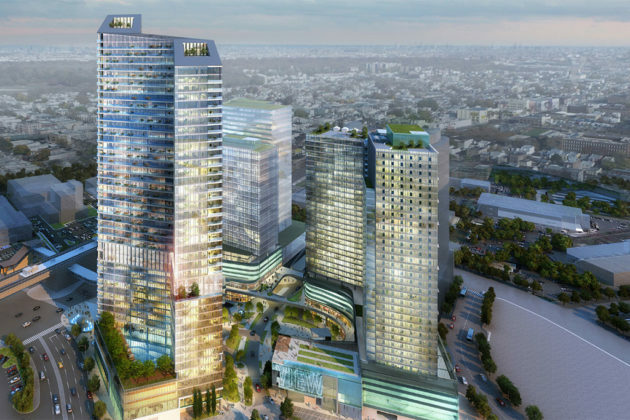 One challenge to urban connectivity in North Central is posed by the monumental Rotonda gated condominium community. The immense size of the two interlocking buildings, their position on a large hill, and the total lack of any sidewalk amenities adjacent to them, add up for an area that’s quite unpleasant to walk past. These buildings — though undeniably a striking contribution to Tysons’ urban milieu — are an obstacle standing between North Central and the urban amenities (Metro, performing arts, retail) in the nearby Tysons East district. North Central faces another obstacle in its connection to the malls and Metro station of Tysons Central 123 — a steep uphill slope. Fortunately, North Central is served by a technology capable of overcoming both of these obstacles: the humble bus. For only fifty cents, those residing in or visiting North Central can hop on a Tysons Circulator bus that will carry them to either the Spring Hill or the Tysons Corner Metrorail station. A bus from each line arrives every 12 minutes or so throughout the day, from early morning until midnight, helping North Central share in the value created by mass transit. Although there aren’t specific plans in the works, Fairfax County expects to one day upgrade the line to higher-quality service or even to a streetcar or light rail system. This district has seen its share of development in recent years. 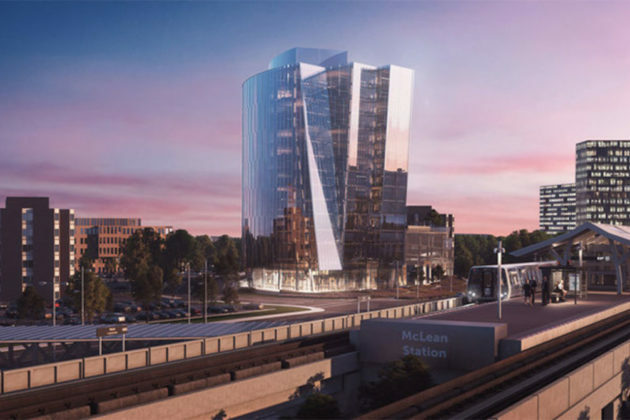 These include a luxurious four-building residential project at Park Crest, eleven floors of new class-A office space at Tysons Overlook, and the residential Highgate. 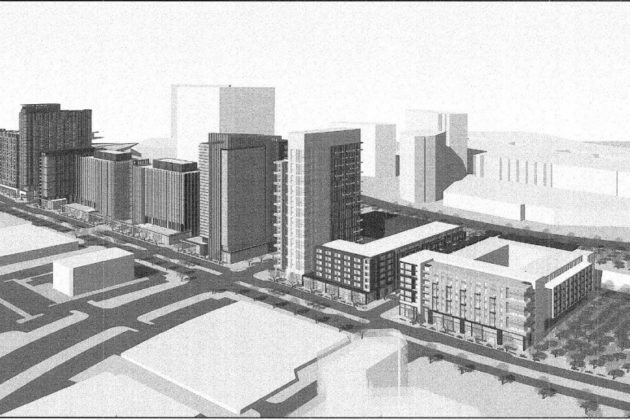 In the near future, that last building could be joined by a 13-building mixed-use development called The Mile — if it is approved by the Fairfax Board of Supervisors at hearings in June and July of this year. Development here is less frenetic than in the downtown districts, but it is ongoing at a healthy pace. The Tysons Comprehensive Plan notes that, as circulator service is improved, greater residential density may become possible. 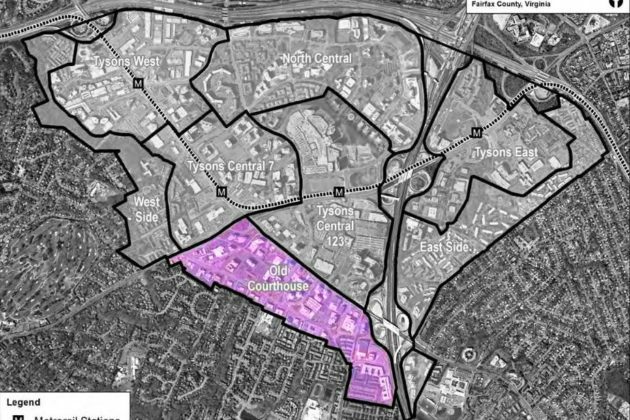 However, one possible problem is that the provisional location of the park, as listed in the Comprehensive Plan, clashes with the proposal for development of The Mile. 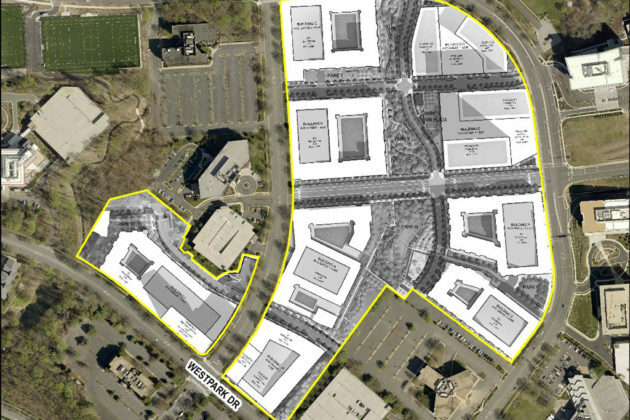 The Mile’s plan does include a large central green space, but it is not quite as large as Fairfax envisions, and does not include athletic fields. The Comprehensive Plan also states that a new elementary school will be needed to accompany population growth in this area. Editor’s note: Over the next several weeks, Tysons Reporter is profiling the eight districts of Tysons. This is the fifth article in that series. Tysons these days has a bit of a reputation as a cultural wasteland. Even today, that’s not quite true, and if the plans for Tysons West come to fruition it won’t be true at all. The Tysons Comprehensive Plan envisions this area, which is centered on the Spring Hill Metro station, as one of Tysons’ four downtown districts, an “arts and entertainment center.” The plan calls for a high-density diversity of uses, “tree-lined streets”, and “a series of urban park spaces.” Over 18 million square feet of development, including what could be Tysons’ tallest tower, is in the works, and much of it (though not yet the tower) has been approved. Today, Tysons West is the least developed of Tysons’ four downtown areas. Much of the land is still covered by car dealerships. But the arrival of a more urban form of transportation — the Silver Line — has sparked intense plans for redevelopment. These plans, although by a range of different developers, share many elements that characterize projects across Tysons. They’re dense, mixed-use, and are built with an eye for pedestrian accessibility, meaning that residents should be able to fulfill daily and weekly needs without motorized transportation. They’re outward-facing, with most attention and retail activity on the sidewalks of public streets rather than inside buildings or isolated courtyards. And they connect to one another, through a new grid of streets, helping residents of one development enjoy the amenities of another. Many of these projects also promise to bring sports fields, for example in Dominion Square East, or provide funding for fields nearby. There’s so much new development slated for this area that I can’t even list it all, but naming a few key projects should give a sense of the scope of the plans. Dominion Square East, Dominion Square West, and Sunburst will all lie directly west of the Spring Hill Metro, within a five-minute walk. Combined, they will bring us at least 13 new buildings, as many as 3,100 residential units (20% of them to be designated for lower-income residents), over 200,000 square feet of commercial space, and several office towers. The Vesper Trail, which opened recently, passes through this area to connect to the Metro. From now until May 15, local residents have an annual opportunity to influence the funding of transportation projects in Northern Virginia. When tolls were put in place along I-66, the Commonwealth of Virginia decided that toll revenue would be used to fund public transportation and mobility infrastructure projects in the area. Every year, policymakers decide which projects to fund. This year, they have about $20 million — a lot, but not enough to fund all the proposals. That means they need your help to make the decision about what gets cut and what gets funded. Twenty different proposals are under consideration, several of which could affect the Tysons area. Nine of the proposals have to do with improving commuter bus service from places like Fairfax Government Center to downtown D.C. Two of the proposals are for Capital Bikeshare implementation in Fairfax City and in Vienna. Other proposals are for trail improvements that will help people get to train stations, improve intersections, and encourage people to take advantage of slug lines. See here for a list of all the proposed projects. The Northern Virginia Transportation Commission, responsible for the program, will be accepting public comments until May 15. There are several ways to express your thoughts. You can email the Commission at [email protected] or leave a voicemail message at 703-239-4719. You can also fill out their online form. To dive into greater depth, you can attend one of the two open house events that the Commission will host to discuss the program. The first will be from 6-7:30 p.m. on Tuesday, April 23 at the Mary Ellen Henderson Middle School located at 7130 Leesburg Pike, Fall Church. The second will be from 6-7 p.m. on Thursday, May 2 in the lobby of the Navy League Building, 2300 Wilson Blvd, Arlington. Immediately after the second open house, the Commission will hold its monthly meeting, which includes a public hearing. Editor’s note: Over the next several weeks, Tysons Reporter is profiling the eight districts of Tysons. This is the fourth article in that series. For those seeking a calmer but still urban lifestyle within a short walk of parks and of the emerging downtown Tysons, the East Side might be your best bet — and that will only become more true as the Tysons Comprehensive Plan is implemented. The East Side extends along the eastern fringe of Tysons, from Route 7 in the south to the Dulles Access Road in the north, bounded by Magarity Road in the east and Tysons East to its west. Today, it’s mostly composed of garden-style apartment developments like Tysons Landings and the Dolley Madison Apartments. Over the next few decades, it will remain primarily residential, forming a smooth gradient of transition from downtown Tysons to single-family Pimmit Hills. It will not witness rapid increases in density like Tysons East, but rather it will gradually take on a more urban character. That means neighborhood retail, like corner stores and local restaurants, and it means a more cohesive and walkable network of streets. The district might include some offices, which planners hope to configure into a “live-work” combination — imagine the 21st-century equivalent of a craftsman living upstairs from his shop. This district is closely tied to Tysons East, and in a way it is the residential backyard to that district’s vibrant center. Right now, the two are separated by a forest, the Scotts Run Stream Valley Park, that can make it difficult to get from one to the other. 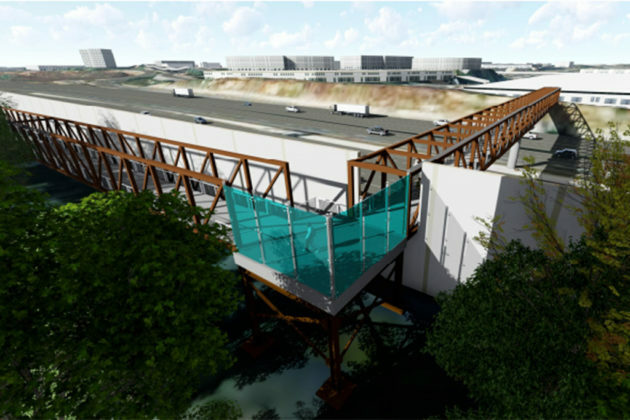 This year, though, Fairfax County will be taking the first steps to change that park from a barrier to a gateway, building pedestrian and bicycle paths to connect the East Side to Tysons East through one of Tysons’ greatest natural treasures. Most of the East Side is only a short walk away from the McLean Metro station, and that walk will become significantly easier – and more pleasant — with the opening of the Scotts Run Trail. The 3T bus on Magarity Road offers reliable and comfortable service to downtown Tysons and to the center of Falls Church. 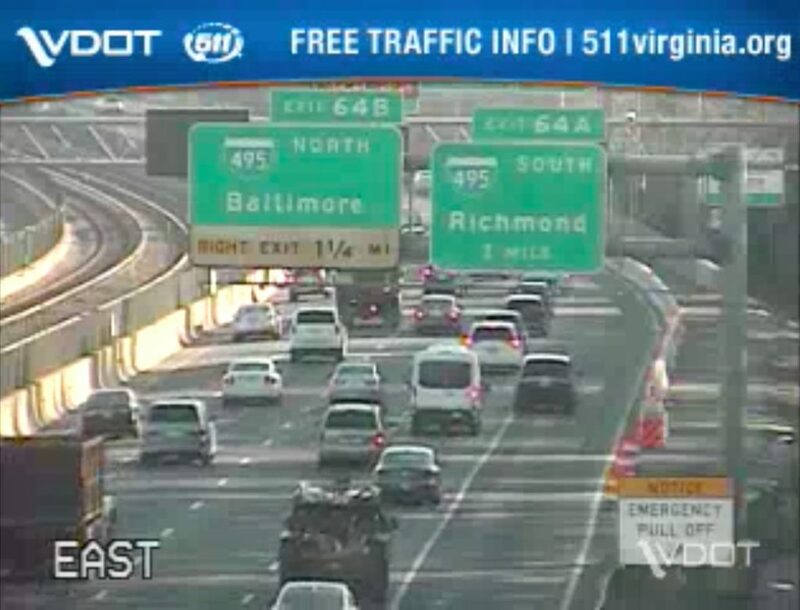 However, right now it is remarkably difficult to walk from anywhere on the East Side to downtown Tysons. That will soon change, though, with the construction of a new pedestrian and bicycle bridge over the Beltway. The bridge will link the East Side directly with Tysons Corner Center and contribute to a more complete network of access throughout the area. 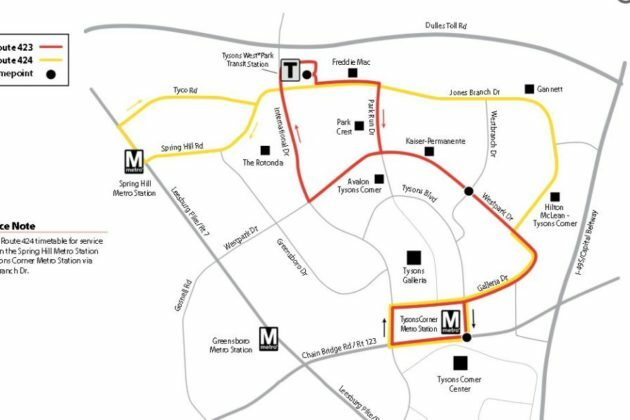 The Comprehensive Plan calls for a circulator system of public transit to span the entirety of Tysons, and although its precise location is still in question, the Plan indicates that it will likely be placed along Old Meadow Road. In stark contrast to nearby Tysons East, which is slated for near-total redevelopment in the next few years, the East Side will see change come more gently — or, at least, in the farther future. 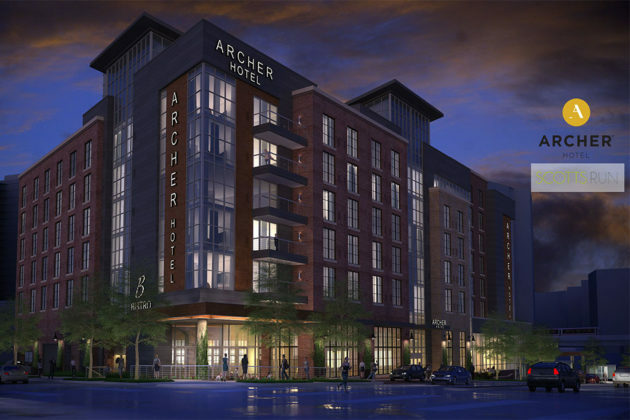 The only project currently on file is a new hotel, and even that is located in the extreme southern part of the East Side — its only office-focused corner. Just because change is coming more slowly, though, does not mean it will never come. Editor’s note: Over the next several weeks, Tysons Reporter is profiling the eight districts of Tysons. This is the second article in that series. Arriving at the McLean Metro station today, your first impression of Tysons is a construction zone — impressive, perhaps, though not the most inviting. But, sooner than in most other districts, “America’s Next Great City” will be rolling out a verdant welcome mat and transforming Tysons East into an urban park and a vibrant gateway to Tysons’ downtown. Tysons East, one of Tysons’ eight districts and one of its four “downtowns,” is the area around the McLean Metro station. It already holds the Capital One tower, which is the tallest building anywhere between Baltimore and Richmond. That won’t be the last tower to pop up in the district: the aptly-named One Tysons East will soon be joining it. Each of the four downtown districts has a specialty. Tysons Central 123’s two malls make it a shopping paradise, Tysons Central 7 is already known for its high-powered offices, and Tysons West is slowing developing a cultural scene. Tysons East — though a mixed-use urban environment with plenty of offices, shops, and residences — will be characterized by two unique attributes. 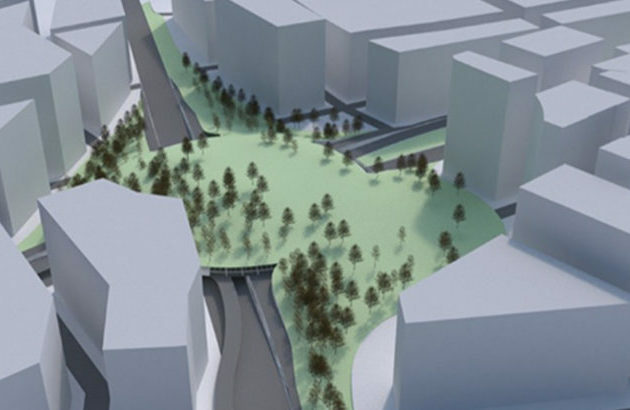 First, plans are in the works to improve and extend the Scotts Run Stream Valley Park, making this into the greenest corner of downtown Tysons. Second, planners envision Tysons East as home to public uses, like educational institutions, that would make it a hotspot for the creative class. One of the greatest failures of past generations of urban planners in Fairfax was their failure to preserve nature. This generation of planners is trying their best to regain the park space that was lost, planning reclusive gardens and natural spaces as a nearby retreat from the chaos of downtown Tysons. In Tysons East, they’re working with the Scotts Run Stream Valley Park, a half-mile-long strip of dense forest extending south from the McLean Metro. Although today it’s fairly uninviting, without designated trails or other recreational facilities, there are plans in the works for it to become a beautifully-landscaped public green. 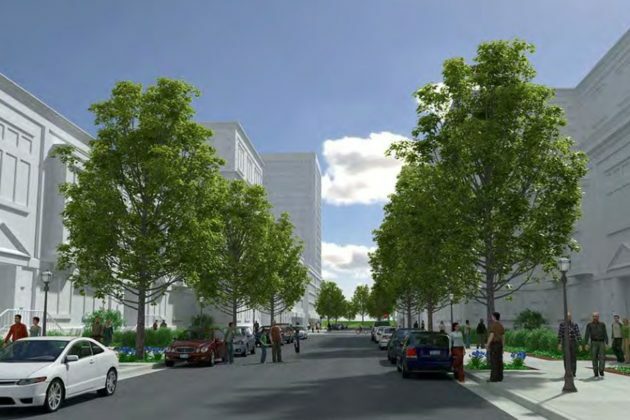 This new park will also function as a connector, with pedestrian and bicycle paths to join the residential neighborhoods of the East Side to the bustling downtown of Tysons East. In fact, the first pedestrian path, from Magarity Road to Coleshire Meadow Drive, should be under construction in the next few months. Dave Whitman is a principal at SmithGroup, the planning and urban design consultants responsible for the Scotts Run development that will redefine Tysons East. He explained that the Scotts Run park will contribute much more than a name to the development — it will shape the area’s urban visual identity. “Elements from Scotts Run such as water, vegetation, wood, and stone will be incorporated into the design of the public spaces and streetscape throughout the project,” he said. One defining feature of the Comprehensive Plan’s vision for Tysons East is institutional. The Plan states that “public and institutional facilities such as professional education, recreational, health and sports amenities should be located in this district.” By emphasizing the educational and recreational role of the district, planners hope to make it a more diverse and desirable residential area. However, the Comprehensive Plan doesn’t actually include specific plans to incentive these kinds of institutions, and current redevelopment plans — which cover most of the district — do not seem to include such uses, except for some athletic fields. Editor’s note: Over the next several weeks, Tysons Reporter is profiling the eight districts of Tysons. This is the first article in that series. Tysons Central 123 is the commercial heart of Tysons. Residential towers, tree-lined boulevards of storefronts, and perhaps a convention center will catalyze the continued success of this retail district as the Tysons Comprehensive Plan is carried out. Tysons Central 123, named after Route 123, contains over half of Tysons’ retail floor space. Almost all of that retail is concentrated in the two enormous malls that define the neighborhood: Tysons Corner Center, south of Chain Bridge Road, and Tysons Galleria, north of it. Combined, they make the district a regional shopping destination. As it stands, Tysons Central 123 is a major shopping destination — but very little else. That was a successful approach when Tysons was only a suburban mall, but now changes are in the works. The district’s section in the Tysons Comprehensive Plan calls for it to evolve into a full-fledged neighborhood. That means tree-lined boulevards rather than congested highways, it means mid- and high-rise buildings rising around the malls, it means more retail at street level, and it might mean a convention center. Fifth Avenue in New York isn’t only a shopping destination. It also offers cultural destinations, a pleasant outdoor streetscape, and a large residential community. All of these will increasingly appear in Tysons Central 123, supplementing the shopping rather than detracting from it. Retail will continue to define the neighborhood. “This district is envisioned to remain the region’s signature shopping destination,” states the Comprehensive Plan. One particular feature of the Tysons Central 123 district is the steep topological slope down from Tysons Drive to Westpark Boulevard. Planners see this challenge as “an opportunity to integrate the district with the adjacent North Central District” through “terraces and plazas” that could provide a unique character to the surrounding neighborhood. Today, the area has strong transportation options: the Tysons Corner station of the Silver Line anchors the center of the district. The transit center there is served by eight different bus lines, more than any other point in Tysons, connecting to destinations near and far. However, with increasing density, existing challenges for mobility will become more pronounced. 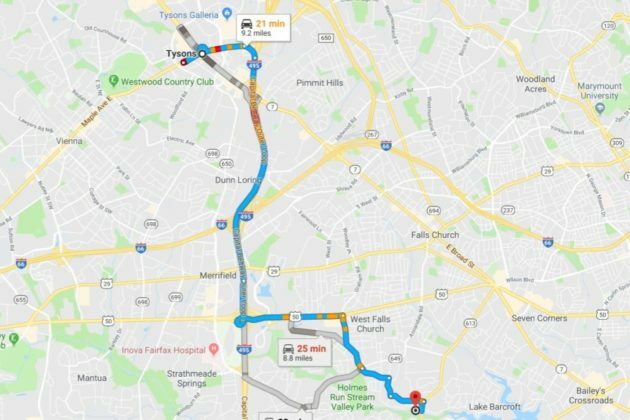 Directions from Tysons to the seedling sale location, image via Google Maps. 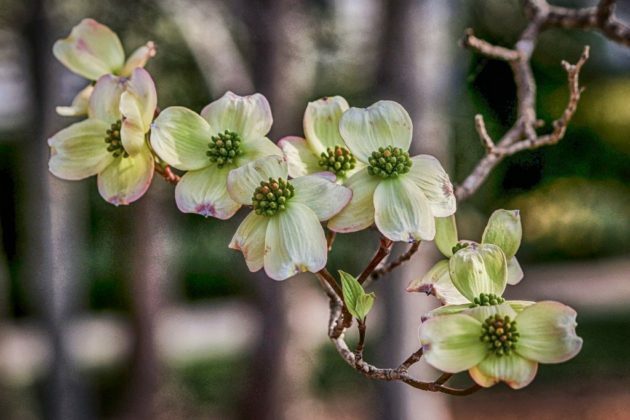 Northern Virginia is home to an astonishing variety of native species of trees and shrubs, and now you have an opportunity to grow your own. Fairfax County’s annual Native Seedling Sale will be taking place today, Friday April 5, from 9 a.m.-4 p.m., and tomorrow, Saturday April 6, from 9 a.m.-noon. The event will be held at the Sleepy Hollow Bath and Racquet Club, at 3516 Sleepy Hollow Road in the Falls Church area. This year’s theme is “Incredible Edibles,” so be prepared for plants that delight the tongue as well as the eye. The plants include seedlings of pawpaw (Asimina triloba), a tree native to a wide swatch of the greater Appalachian region. It bears a delicious fruit which was recently highlighted by National Public Radio’s The Salt as “the hipster banana”. Other selections include the American wild plum, the American elderberry, the black chokeberry, the American Hazelnut, and the flowering dogwood (Virginia’s state tree). The packages cost only $12.50 or $17.50, depending on contents, and are easily transportable in a car — though the organizers recommend you bring a small bucket, basket, or doubled-up paper bag. Northern Virginia boasts the state’s first modular roundabout — a new traffic management technology that could become part of everyday life in Tysons. Drivers venturing out to Annandale might have noticed something unusual at the intersection of Ravensworth Road and Jayhawk Street. 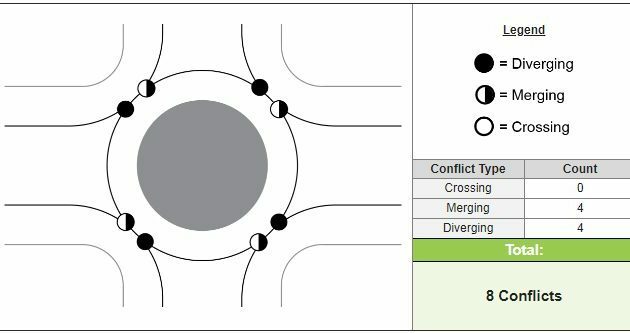 This avian-named crossing is home to Virginia’s first-ever modular mini-roundabout, a new type of intersection design that could see much more widespread use across the region, including in Tysons. Before last May, the intersection had only had stop signs on Jayhawk. But traffic was increasing, and cars turning from Jayhawk onto Ravensworth were having to struggle to turn enter the road safely. The Virginia Department of Transportation (VDOT) decided they needed to do something to keep cars moving. 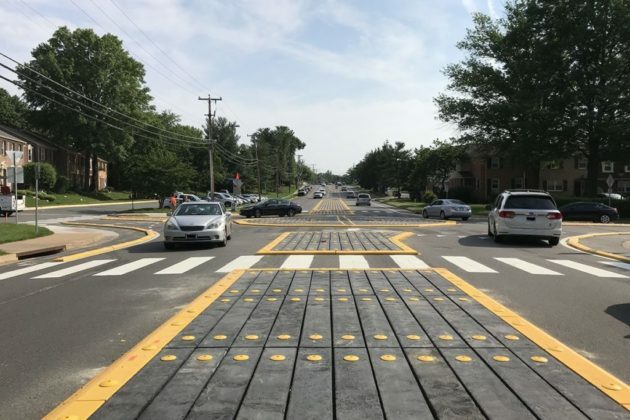 “The primary purpose of the roundabout was to allow side streets to have safer access onto the main road,” explained Terry Yates, Assistant Transportation and Land Use Director for VDOT in Arlington and Fairfax Counties. The goal was achieved: the time that cars spend waiting to turn onto the main road has dropped by almost 90%. For a long time, those were the only choices. But the new modular mini-roundabout is unique because it is made out of a special plastic rather than concrete. That gives it a number of enormous advantages. First, it brings down the cost — tremendously. This design cost only $137,000 of VDOT money, although it would have been a little more expensive without materials donated by the Federal Highway Administration. Second, installation is easy. Setting up the intersection took only two weeks, slightly less than a comparable non-modular project in Vienna. There were no impacts on utility lines or right-of-ways, and only minor impacts to the pavement. Third, it’s eco-friendly. The plastic material is made from recycled milk jugs, reducing not only costs but also pollution. That environmental friendliness doesn’t come at any kind of cost to effectiveness: the material in question is durable and strong enough that it’s used industrially for railroad cross-ties. The solution isn’t perfect: VDOT has yet to develop a snow-removal procedure, and some drivers complain that the design is difficult to see at night. Although the roundabout was built to be easily removed, Yates clarified that it “may not be temporary.” If the design continues to function as effectively as it has for the past ten months, there’s no reason it shouldn’t stay as it is — and no reason why it might not be emulated elsewhere, especially in Tysons. 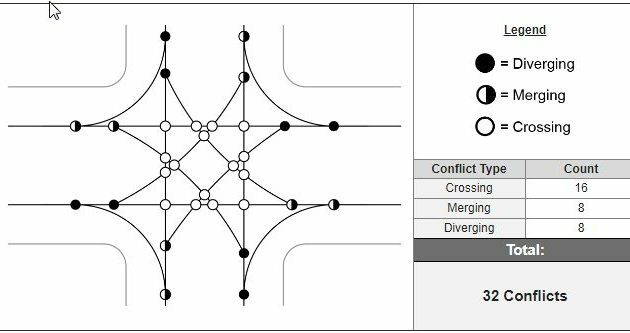 With Tysons slated to grow to 100,000 residents and 200,000 jobs in the next thirty years, this cheap, safe, effective intersection design could be coming to local streets in the near future.